Revitalizes and moisturizes the skin. Purifies and softens the beard. 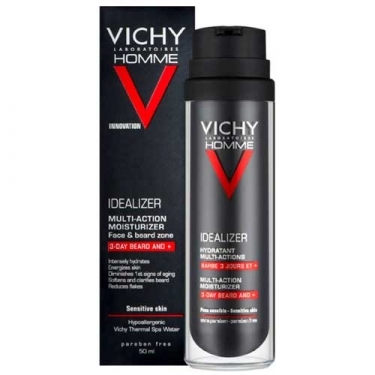 DESCRIPTION: Homme Idealizer Hydratant Multi-Actions Barbe 3 Jours from Vichy is a moisturizing aftershave with multi action for men who wear beard of three days or more. Formulated with Hyaluronic Acid, Caffeine, Adenosine and Salicylic Acid, moisturizes and revitalizes the facial skin while exfoliates and has anti bacterial and anti-aging action. The beard looks clean, smooth and healthy and the skin feels comfortable. Non-greasy texture. Hypoallergenic. Apply to the face morning and evening. Ideal for men who wear beard of three days or more.